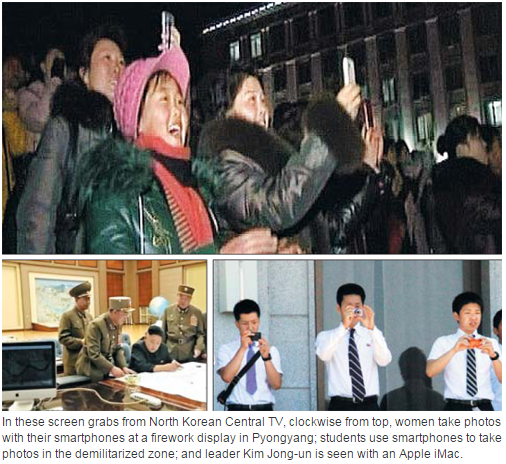 According to a report in The Chosun Ilbo this morning, wealthy people in North Korea prefer foreign smartphones, as shown in the accompanying screen captures from North Korean Central TV (click to see a full sized version. 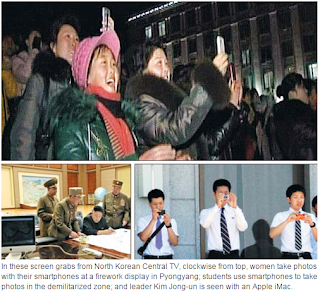 The article noted that "High-end Western smartphones are all the rage among women traders in North Korea's thriving open-air markets, a source said Friday. Seventy percent of all cell phones in North Korea are concentrated in Pyongyang, the source said, and North Koreans now prefer imported gadgets to locally manufactured ones. iPhones and Samsung smartphones have become symbols of wealth, with two out of 10 female traders now flaunting imported phones, according to the source." If such reports are accurate, they would be in line with the global trend toward commoditization of smart phones, which are essentially modular in nature and tend to become cheaper, more powerful and more portable (lighter weight) all the time. Such changes help to explain why Chinese manufacturers have recently cut into Samsung Electronics share of the global smartphone market. 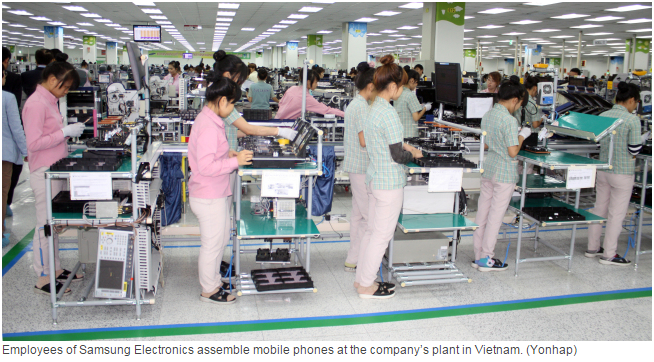 They also explain why, as reported in The Korea Herald, Samsung is planning to build a second smartphone plant in Vietnam. The article notes that "Samsung Electronics has been approved by the Vietnamese government to invest $3 billion to build a smartphone manufacturing center in the Southeast Asian country, according to the tech giant and local news outlets. 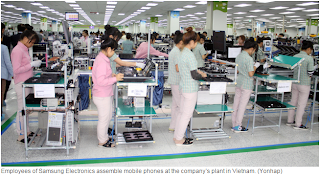 The new factory will be built in Thai Nguyen province, north of Vietnam’s capital Hanoi, where the South Korean tech conglomerate has been operating its first smartphone plant in the country since last March. (click on the accompanying graphic for a full sized version) Samsung Electronics invested $2 billion to build the first smartphone factory, which has about 16,000 employees producing and assembling 120 million low-cost phones a year targeting developing markets.